Are you stressed out? Are your muscles cramped and aching? Our modern lifestyle tends to do this to you. These days, our work life is so stressful and our time to relax is limited. Very few of us find the time to just chill. The result is anxiety and stress. A hot tub, however, allows you to soak the problems away, or if not, at least give you the chance to relax. Plus, healthwise, it is good for you! These days, however, hot tub reviews are to be found everywhere! This makes finding the one that is perfect for you difficult. To make life easier, we have compiled some information every prospective hot tub buyer needs to know about hot tubs, plus, our team has looked over a number of hot tubs and made a list of the best hot tubs around.The information allows you to make a better choice before buying the best hot tub for your needs – and your pocket. But before making that final decision, isn’t it a good idea to learn more about hot tubs? Did you know there are different types? Knowing these differences puts you in a position to choose the right hot tub for your needs – and pocket! 9 Why Buy A Hot Tub? Choosing the best hot tubs for you might seem a difficult job indeed. 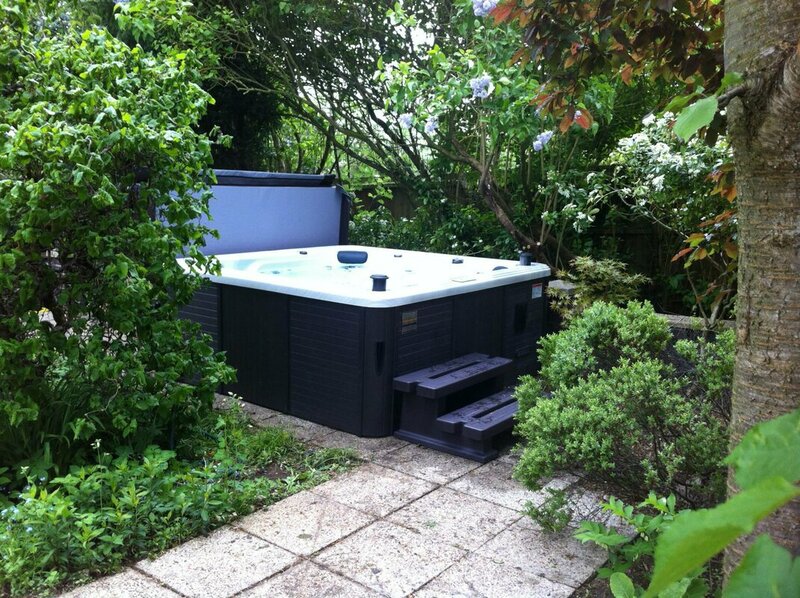 So we have taken a look at eleven different hot tubs to get you started in your search. Aquarest Spas is the leader in manufacturing spas since 1997. They take entertainment, relaxation, and health seriously through hydrotherapy. Their products have the California Energy Commission’s seal of approval for being efficient in energy. This product has a plug and play setup, a cabinet that is durable and roto molded, underwater jets that are made from stainless steel, and an advanced filtration system. It is easy to install. Hiring an electrician is not needed. It plugs to a standard 120 V outlet. It is made from a material that is durable, thermal, and plastic. It can also withstand different weather conditions. It gives complete relaxation through its hydrotherapy waterway jets that give enough water pressure to massage a person’s muscles. The Easy Kleen Filtration System makes sure that this spa has crystal clear water all the time. If needed, the water is not difficult to change. The control valve lasts for a long time. The cord’s length is only 12 feet. There are a lot of luxurious hot tub spas out there, but we love a hot tub spa that has is built with attention to details. And this hot tub spa by Home and Garden Spas is one of those hot tubs that are worth every penny spent. Why? It has features that target safety, durability, flexibility, and leisure. This hot tub has slip-resistant flooring. added safety, built-in seating is what the tub offers. You can save energy bills with its spray foam insulation feature. GFCI plug is not included, but we highly suggest you get one for an added safety feature. You cannot use the usual home cleaners. Never use cleaners with ammonia or solutions that are citrus-based. These don’t work well with acrylic. 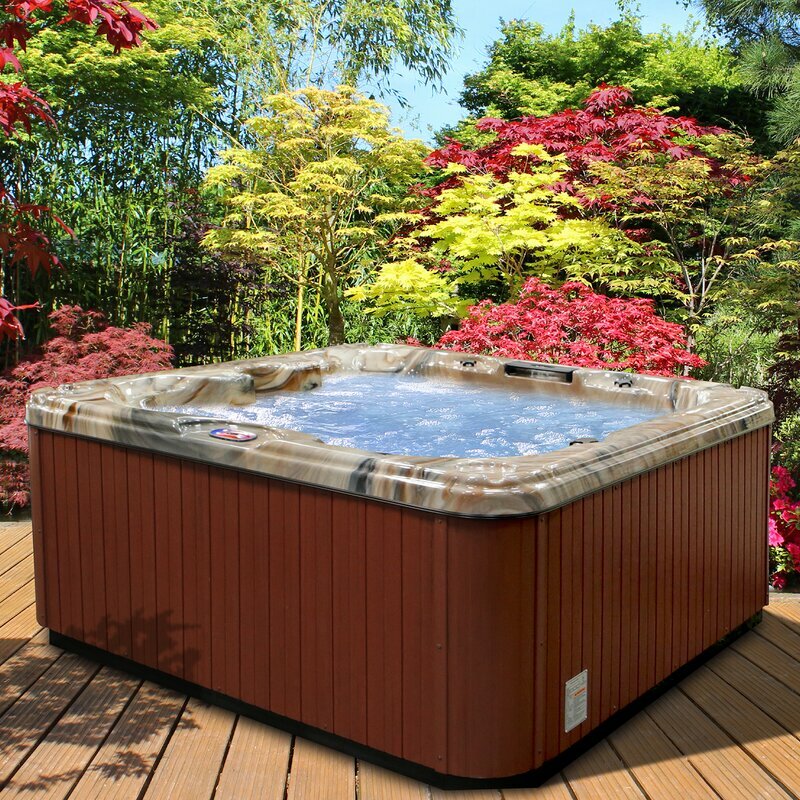 The insulated, lockable hard cover included with this spa makes it ideal for outdoor use in cold climates. 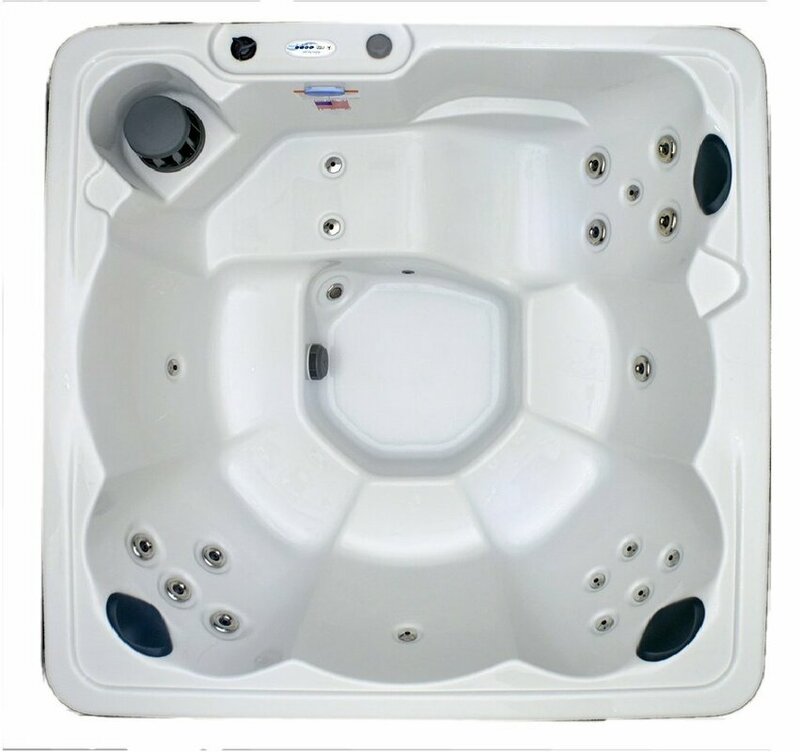 Those who like to listen to their favorite music while soaking in a hot tub would surely love this hot tub model by American Spas. Its Bluetooth system lets you connect your Bluetooth-enabled device to your hot tub’s audio system. After which, just play your playlist, and you can already enjoy your favorite songs while in the hot tub. Not only that, this hot tub is also made out of acrylic, but the highlight is that instead of the usual white and ivory shade, this one is also available in an Ocean-like color. We love its Pacific Rim and Mist colors. This has an Ozonator. So, you know your hot tub water is sanitized and free from germs and other harmful bacteria. Want bubbles? No worries. This hot tub spa has an air blower included, which blows air into the tub, thus creating bubbles. The freeze-resistant feature surely comes in handy during the winter season. Getting in and out of this tub can be quite a hassle for some since no steps are included. This hot tub is particular with water maintenance. Changing of water is recommended every 2 months. 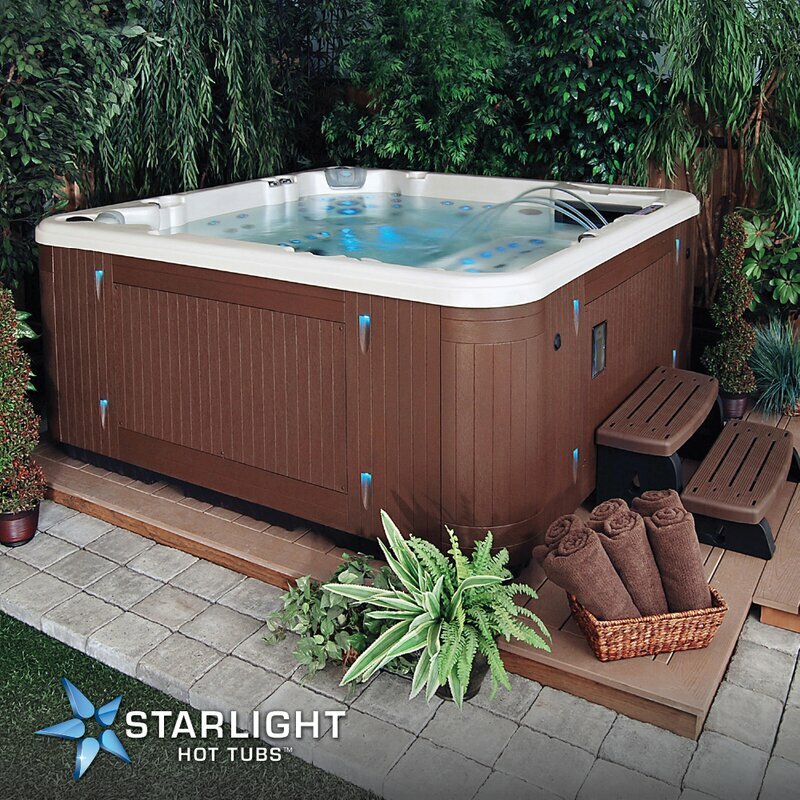 A real spa with roto molded technology that allows you to create your own backyard oasis. The lightweight design and rectangular shape make this portable spa a great addition to your home. If you want a slightly bigger space to make room for one more person, then this 4-person hot tub spa by Lifesmart Spas may be a great choice. We are instantly drawn to its unique sandstone color, a fresh alternative from all the white and ivory-colored models. 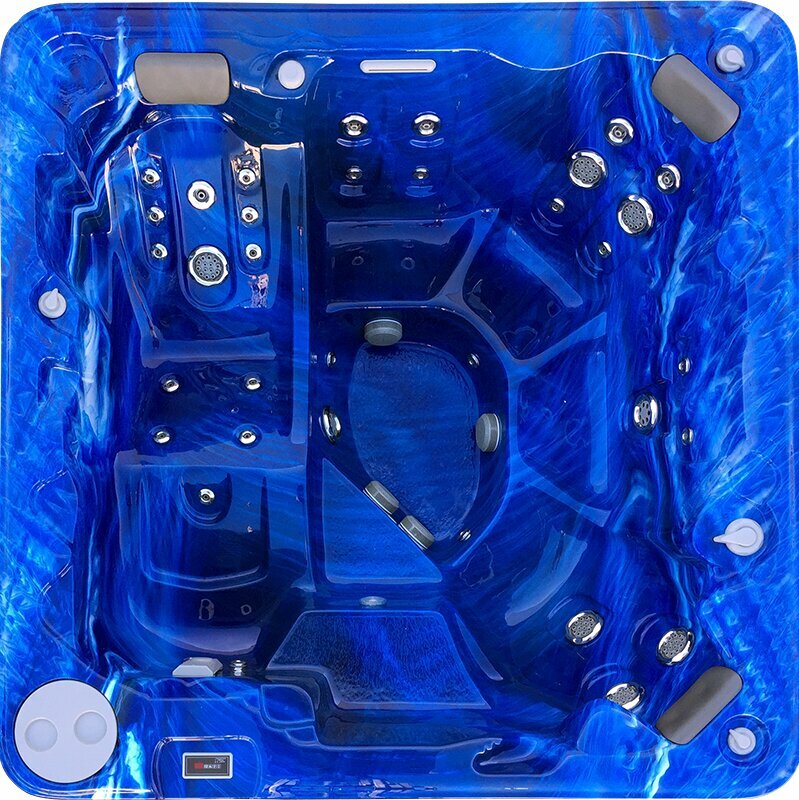 We also love that despite its slightly lower price 9as compared to other hot tub models), this hot tub has some cool features that you usually find in more expensive models. It features waterfall jets, underwater LED lighting system, and surprise— an Ozonator and foam insulation! 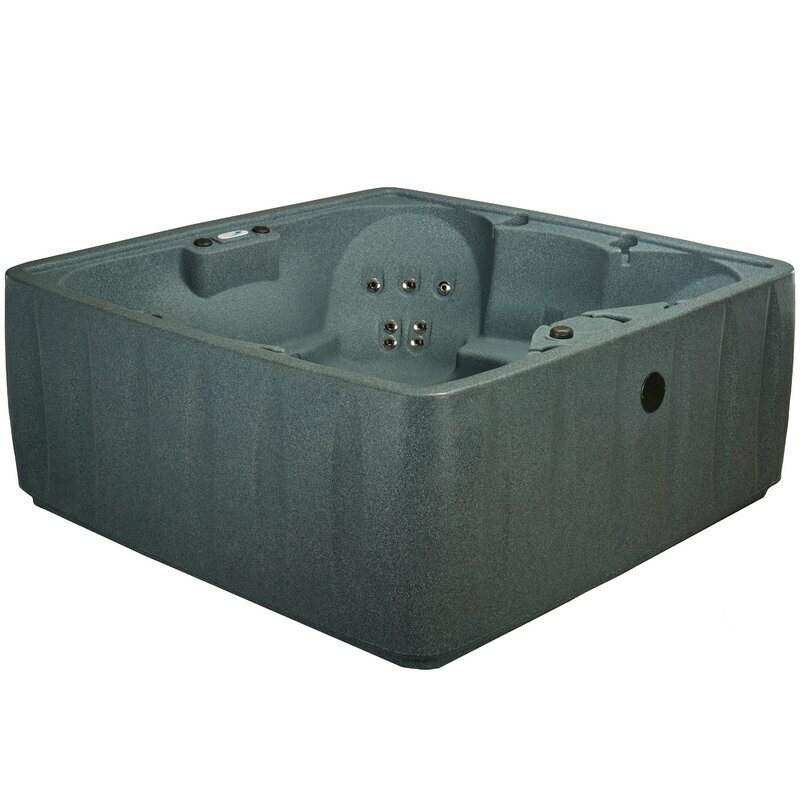 This is a great value hot tub spa that is priced reasonably but does not fall short when it comes to quality. The LED lights are multi-colored, letting you set the mood whichever you want. But what we love about this model is its thermal friction heating system. This helps eliminate the need for a separate heater. This type of heating system captures energy from the tub’s pump and converts it to heat. Its spa safety cover has a lock feature. You can plug this hot tub in a standard unit. The primary material is plastic, which is kind of categorized as a cheap material for hot tubs. Being Mexico-made, you can guarantee that this product has passed product standard quality test in the U.S. 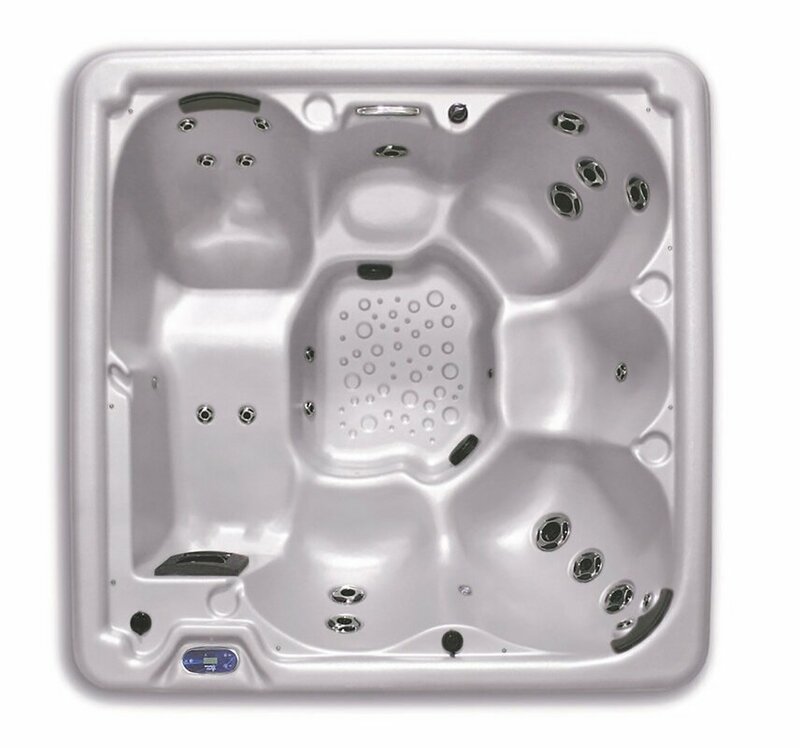 The four-seater hot tub has standard features that include stainless steel therapeutic jets that access all parts of the body. The cabinetry is synthetic and maintenance free while the frame is pressure treated with an ABS bottom for durability. Have a family of five? This is the perfect hot tub size for you. With a 5-person seating, all your family members can enjoy a relaxing time together. This model can be filled with up to 315 gallons of water. Being a plug-and-play model, users without special hot tub knowledge can easily use this hot tub. No installation process needed and no tools required. The full foam insulation system provides maximum heat without consuming more energy. 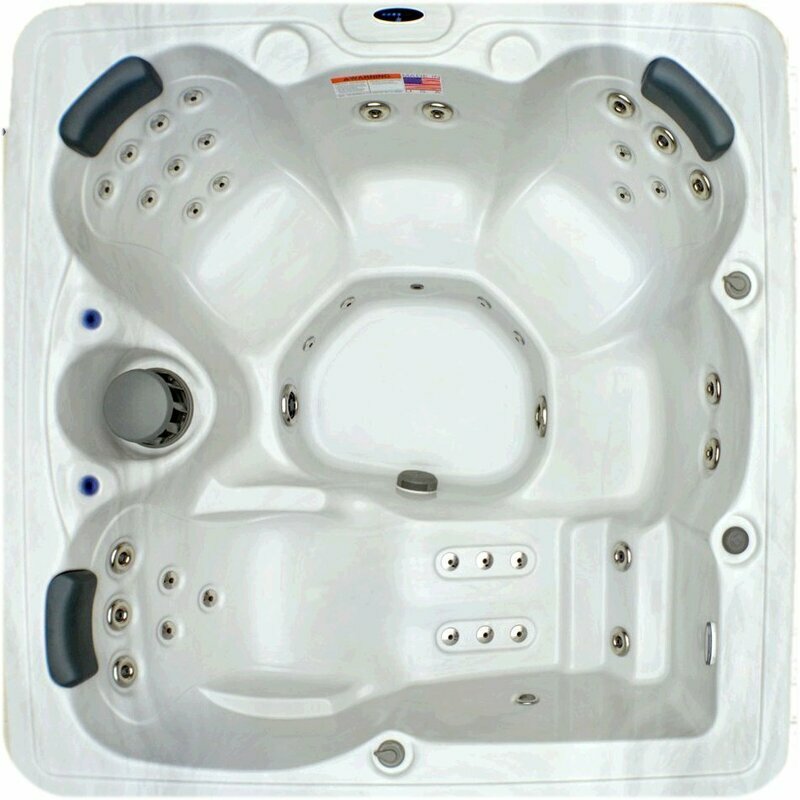 Hot tub has an insulated and lock-safety cover, LED lighting system, Ozonator system, and waterfall jets. Winterization of this hot tub is made easy, thanks to it being freeze-resistant. If you a green advocate, you’ll love how 30 percent of the material used is recycled. Recycled hot tubs are not for buyers who want an all-brand new and first-class hot tub. This somewhat looks cheap as it is made out of plastic. This is another hot tub option which is being offered at a fair price. 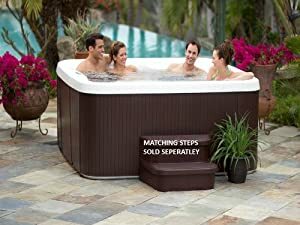 But what we like about this hot tub is that it is available in three different colors, namely Brownstone, Cobblestone, and Graystone. This product has certifications and is guaranteed to be safe to use. If you want a round shape for your hot tub for a change, then we’re confident you’ll love this product. This is also a plug-and-play model that can be placed on your backyard, high deck, or patio. Users of this hot tub praise the no-fuss operation. It is also easy to maintain. Moreover, it has an underwater LED lighting and digital controls. Considering its price, we believe it’s a winner. You can choose which colors fit your taste more. The stainless jets are also adjustable, and independently, we may add. Add bubbles or double bubbles with just a simple twist. This is also slip-resistant, freeze-resistant, and mildew-resistant. Homeowners looking for a budget-friendly hot tub will love this hot tub. A total of 20 hours or more is needed to set up and heat this hot tub for the first time use. Steps are not included, so you have to buy your own. All the fittings were not tight, so check them out before you use the tub. We don’t know about you, but we love a hot tub with more water jets. The more water jets the tub has, the more relaxing the experience will be. We love it when more streams of water focus on massaging the different parts of the body. 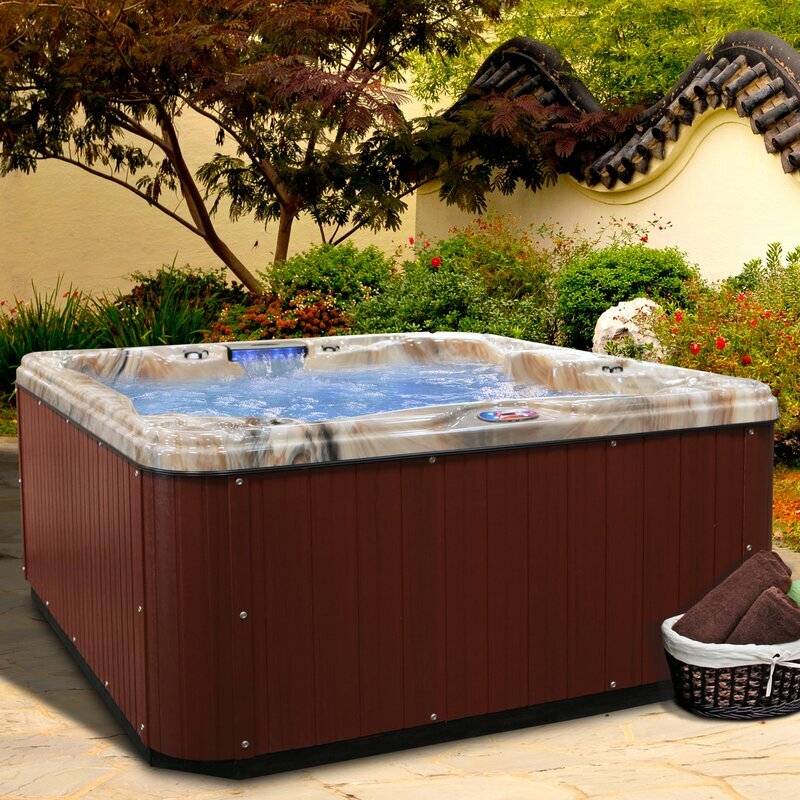 You will surely get your money’s worth with this hot tub spa since it has a high-performance pump, as well as high-quality synthetic cabinetry. All the other features that most people look for in a hot tub are also found in this product. This acrylic hot tub has a lockable cover, LED lighting, antimicrobial property, and other must-have features like being stain-resistant, slip-resistant, and more! This is a standard type hot tub that can be plugged into most electrical outlets. You will instantly feel relaxed, owing to its 51 water jets. The water heats and circulates at the same time, so waiting time before the relaxing effect takes place is reduced. It has its own Ozonator. This is more in the expensive hot tub category. Product warranty is shorter, one-year to be exact. This hot tub reviews is a great product released by American Spas. They deliver a total body hydrotherapy experience with this product. The product comes with contoured seating for 5 persons. There is a full-length lounger to deliver the ultimate body massage. There are 30 jets which are placed carefully along the lines of your body. You can comfortably lean back in the luxurious seating and allow the jets to massage away the day’s stress. The product is durable and features the insulation of fiberglass. The 7-layer laminated fiber steel construction system is unique to this spa. The material is reinforced with wood and steel to build the strongest shell in the industry. The spa is built from the thickest acrylic available to ensure the durability and long life of the product. The HydroClear Ozonator helps purify the water with active ozone bubbles. This helps keep the water clear and sanitized at all times. There were no cons reported by any buyer. We love a good hot tub with great quality and features, and this hot tub surely doesn’t disappoint. It has an Easy Clean Filtration System that makes sure 100 percent of the water is being filtered. This is also LED light-ready and has a built-in seating for your convenience. Color choices? Yes, this model also features that. Incredible filtration system that maintains the water. Utilizes the power of natural oxygen to keep the tub’s cleanliness. It has the CEC seal or the California Energy Commission seal. What sets this from other hot tubs is its vinyl thermal cover which is marine-graded. This is offered at a high price, but you can get this at a discounted rate if you’re lucky. This only has 29 water jets, which is a bit too few for a hot tub that fits 6 people. People who love the acrylic and synthetic wood material combination on their hot tub will like the Toronto hot tub by Canadian Spa. Moreover, this has fiberglass material, adding to the tub’s appearance. We also love its coffee exterior and the LED lights included, which help set the mood for a more relaxing hot tub spa experience. You get to enjoy its aromatherapy function, for a full spa experience. Listening to your favorite music is possible with its Stereo MP3 connection. This includes insulation cover/locking cover. It also has a cup holder, so you can enjoy your favorite drink. You need an electrician to install this hot tub. Cleaning products specifically for chlorine sanitation is recommended. This is made out of acrylic and resin, materials that are commonly used in hot tubs because of their strength and weatherability. A safety cover is also included, which can be locked for added safety when the tub is at idle. You can also enjoy waterfall jets and LED lighting system. It’s a plug-and-play model, so no special installation process is needed. The safety cover is insulated and has a lock. Some hot tubs are just difficult to clean. Well, not this one. For a start, this is mildew-resistant, stain-resistant, and can be cleaned pretty easily. It doesn’t have an Ozonator. You also have to buy your own steps for this tub. This tub uses additional materials like plastic, so expect that it has a shorter lifespan. A product that gives you the option of having it customized on purchase! You can opt to either have added insulation, a slip-resistant surface treatment, or an ozonator. Of course, you can opt for all! A 7-foot, six person spa with lounger that offers you numerous options by simply directing your hydrotherapy jets. The cathedral style staircase provides you easy access while giving a stylish touch. Invite your friends over for hot tub party with this 7-person hot tub. With a reliable Ozonator system, having more people in the hot tub will not affect the water’s cleanliness. You will also love its 30 massage therapy jets, which you can adjust to your liking. No assembly and installation needed, so you can get the tub ready for the party in no time! With a built-in HydroClear Ozonator that removes harmful bacteria. It has an LED mood lighting to help set and calm your mood. This is being offered at a high price. The 30 water jets may be too few for a 7-person tub. A 7-seater spa with 65 full therapy rotating jets and a hardy rock-solid shell. This brand exceeds the California mandate for spas and hot tubs. For people who want to feel luxurious in the comfort of their own homes, this product is a must-have. Its hydrotherapy massage is first class. In addition, many installments are included. An ergonomic massage lounger that is full body and first mate chairs rejuvenate and relax the tired muscles of the body. There are also other cool equipment such as an audio system that can be run on Bluetooth, spa control through Wi-Fi, lights to match the mood, fountains, and many others. The jets and the water flow can be adjusted. A valve that lets the person choose how much water flows and diverts between the jets. The jets are placed where ache and pain are normally felt. It comes with a hardcover to easily drain out rain and snow. There are many colors and designs to choose from. Waterfall installment is quite fragile, so it might leak if not handled properly. The setup can be somehow confusing. 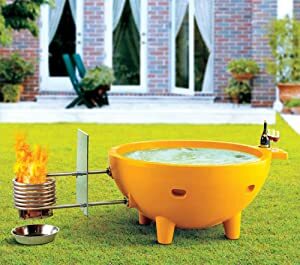 A portable hot tub for outside use. It is small and compact and perfect for one person. People have, for thousands of years, used water as a means of healing therapy. They would flock to hot springs and lay in the warm, relaxing water in an effort to get rid of their various aches and pains. These days, with advancements in technology, the same effects can be got by means of a spa bath. Add to this that you can select your own water temperature and the fact that water jets give you a relaxing massage, then the popularity that hot tubs have enjoyed over the last number of years is not surprising. Modern-day hot tubs, or spas, have a number of hot tub accessories. Each of these has their own function and form an integral part of your hot tub and your enjoying pleasure. We will look at a few of these. First off, we take a look at hot tub covers. They have two functions: firstly they are a safety feature to ensure someone does not inadvertently fall in when the tub is not in use and drown. Secondly, they serve to keep in the heat (as much as possible) when you are not using it. This feature, therefore, saves you a lot on your electricity bill, as the water does not have to be heated from scratch each time you use it. To make life easier, you can install a hot tub cover lift. This is a frame that you can attach to your hot tub making lifting that heavy cover a breeze. Some have hydraulic arms to make things even easier. Unfortunately, most hot tubs need chemicals in order to keep the water clear and free of algae and bacterial buildup. The most commonly used hot tub chemicals for this purpose is either chlorine or bromine. It is best to check the manufacturer instructions as to which is best for your spa. It is also a great idea to check your water quality with a test kit or test strips before adding chemicals. Probably the most important hot tub accessory is the hot tub filter. It traps all impurities in the water as it passes through, keeping them there until the hot tub filter is either cleaned or replaced. Your hot tub pump is the heart of your spa as it ensures a constant flow of water throughout. Without it, your hot tub jets would not work and you would not get the massaging action a hot tub is known for. Also, the pump is essential for the heating of your water. The water is heated by the heater, but the hot tub pump sees that the heated water is distributed. In a hot tub, an element is housed in a heater assembly housing. The hot tub pump pushes water through this tube. In turn, when the water moves through the hot tub heater, heat is transferred from the element to the water, heating it up. Heated water (usually from the filter bay) is pulled into the jet pumps which then pushes the water out of the hot tub jets and into your tub, providing you with a massaging action. A hot tub cleaner is a cleaning agent you add to your hot tub water before allowing it to flush through the system for a few minutes. It cleans the sides of the tub. Once done, you need to drain your tub and wipe off any residue that may be left behind. Hot tub enclosures allow for privacy and act as weather breaks. The types come in all forms and shapes, from built ones to those that are prefabricated. It also helps to keep out debris, e.g. leaves and dust. Keeping your hot tub clean is often bothersome and tiring. Thanks to ozonators, maintaining household hot tubs or commercial spas is now made easy and convenient. An ozonator is a hot tub accessory used to sanitize water via an oxidation process. It is used to purify spa water by eliminating contaminants using ozone or oxygen. Ozone in water eliminates the need for traditional cleaning process of using chemicals, thereby, minimizing the risk of irritation and other health complications. Aside from purifying, sanitizing, and disinfecting spa water, ozonators also deodorize the water, keeping it clean, clear, and odor-free. Since chemical cleaning is no longer required, installing ozonator is considered as one of the safest ways to clean spas and extend the life of your hot tubs. Hot tubs are situated either above the ground, or in the ground. A hot tub also differs from a normal bathtub in that it has jets and a constant temperature selected for relaxation purposes. Because they are larger than a bath, often fitting up to six people or more, depending on their size, they are often also a social gathering place for a group of friends. Remember, unlike a walk in tub, a hot tub is climbed into, sometimes by means of specially molded steps. So before you decided on purchasing a hot tub, make sure that it is the best hot tub for you and your family (and friends). An outdoor hot tub is probably the most cost efficient type of hot tub. You either dig a hole outside to put it in or allow it to stand on top of the ground. There are also different types of outdoor hot tubs to choose from. While this type of hot tub has many advantages, there are also some disadvantages. Although it might be more costly, there are benefits to an indoor hot tub that you do not get with an outdoor hot tub. Let’s look at both the benefits and the negatives. A wooden hot tub was, as the name indicates, originally a tub made out of wood that was filled with hot water. Later, it was heated directly by means of wood and hence referred to as a wood-fired hot tub. These days, hot tubs are intended for outside use and are fitted with pipes, much like a regular hot tub to heat the water and create the bubbling effect. They are usually installed outside. They can be heated throughout the year, or the water allowed to cool down in summer in order to cool off after a hot day. An inflatable hot tub is usually made out of PVC vinyl. All that needs doing is for it to be blown up before use. Everything in the tub is pre-formed, and all that is needed to get it to work effortlessly is to connect it to a heater and pump. An inflatable hot tub is also often referred to as a portable hot tub, although most hot tubs that are above ground could conceivably be moved around with a little effort. A saltwater hot tub gives you just about all the benefits of a normal chlorinated hot tub with one difference: you add salt instead of chlorine. You no longer need to use a sanitizer: Storing chlorine or bromine could be dangerous. A saltwater system makes its own chlorine. Your water is buffered: Because of the minerals in a saltwater tub the waters buffering ability is increased, making it more resistant to changes in pH levels. No more chlorine smell: Salt systems, because they use salt, do not have the same, strong, chemical smell associated with a ‘regular’ hot tub. Soft water: A saltwater hot tub has about 10% of the salt you find in seawater, leaving the water feeling soft and silky to the touch. These spas only work when the water is warm as they have problems producing their own chlorine when the water is cold. The salt cell needs replacement every two to five years as it tends to lose its titanium coating after a while. This is another popular type of hot tub on the market. They are made on the ground level as a small swimming pool. Are made to any size and shape and are durable. This product is made of glass reinforced polyester. They are quite popular on the market today. The terms hot tub and spa are, these days, used for the same thing. Both have hot water jets, allowing for relaxation. Hot tubs, however, were originally built out of wood. During the seventies, however, they began building them out of acrylic and they became known as spas. Most hot tub manufacturers suggest that your hot tub’s temperature should be between 102 to 104 degrees Fahrenheit. This is approximately 38 to 40 degrees Celsius. However, you need to check the working of your thermometer regularly, as many hot tub thermometers become defective at some stage. Overly hot temperatures can have a negative effect on your health, not to mention you run the risk of inadvertently climbing into the scalding hot water! Furthermore, pregnant women should be wary of using a hot tub, as theuse of a hot tub during the early stages of pregnancy increases your risk of having a miscarriage. This is due to your core temperature being raised. If using a hot tub during this time, consider having the water at a much lower temperature. Looking after the water quality in your hot tub is essential to your health. This means you need to test your hot tub water regularly, add the appropriate chemicals, and then test again in order to check whether the pH balance is correct. Chlorine or bromine are the most commonly used forms of hot tub water sanitizers. Depending on where you live, you may also need to check for calcium hardness and adjust your water accordingly. Maintaining your hot tub on a regular basis not only ensures that your hot tub stays in perfect order, but ensures that your hot tub bathing experience is a pleasurable one. You need to clean your filter every two weeks and use a granular filter cleaner approximately every two months or so. The tub itself also needs regular cleaning, preferably with a non-abrasive cleaner so that you do not scratch the surface. Remember to clean the cover as well. If your hot tub cover has a vinyl cover, remember to condition this regularly as well. This will protect it against wear and tear from the elements. Also, check for the presence of any mildew and make sure you take care of the problem if it is present. Taking care of your hot tub means that you need to winterize it for the colder winter months. This starts by turning off the power and draining it. This includes draining any water out of the air blower and pipes as well. Freezing winter conditions can result in any water in your hot tub freezing – and expanding – as well. This could cause severe damage to the hot tub and its different parts. Next, you need to take out your filters and clean them. Ensure there is no water present before putting them back. Unscrew any fittings on your hot tub and ensure any water is removed. Blow out the pipes and make sure there is no water present in any part of the hot tub. Where water is still present, make sure to drain it out completely. Once all water is removed, make sure the hot tub, as well as the cover, are squeaky c lean before putting the cover back and securing it. You are done until the next time you want to use your hot tub! People buy a hot tub mainly for three reasons such as leisure, strengthening, and health. Leisure spas are mostly used for relaxing after a hard day’s work. They are a great way to get together with one’s family or friends. Even a backyard party or a relaxing weekend could be set up thanks to the leisure spa. Health spas, on the other hand, will focus on relieving tension in the body due to physical illness. Even some medical doctors prescribe a health spa to relieve certain mind-body conditions. Hot tubs are also used for exercise and strengthening purposes. They are also called swim spas. They are quite long and designed with powerful water streams. This stream will help build your muscles while you swim in them. Underwater treadmills are another type of strengthening hot tubs. They will offer an impressive resistance while you workout. Most of these hot tubs come with a variety of salient features. You can choose the best spas to suit your personal taste and requirements. You need to remember that, besides the cost of buying the hot tub (and any installation fees that might be needed), your utility bill will go up. Then there is maintenance to think about, i.e. chemicals for cleaning, etc. Does this fit your budget? Will you be able to keep it up in the long run? If installing it indoors, do you have adequate space? Does the room have proper ventilation? How about a water connection? Can you afford to make the necessary changes if applicable? Do you have the necessary space in which to put your hot tub? Is it for indoor or outside use? Does the area in which you wish to install it have all the necessary requirements, such as an electricity outlet and water? What is your main consideration for purchasing a hot tub? Many people buy a hot tub because it is great therapy for certain types of injuries. If this is your main reason for getting one, make sure the hot tub you choose will do the job. Choosing one for its therapeutic value is a vastly different process than choosing one simply for relaxation purposes. Size influences cost. Also, once again, you run into the problem of space. You cannot install a 10-seater into space where only a small 2-seater will fit. Plus, do you want to share your hot tub with friends, or do you prefer the experience to be private? You’re confused. You asked. We give answers. To make your buying decision even easier, we thought why not answer those questions that are stopping you from buying your new hot tub spa? Read on to learn more about hot tubs! 1. Do hot tubs raise blood pressure? Hot tubs do NOT raise blood pressure. In 2011, studies conducted by the North American Sports Medicine Institute, also known as NASMI, reported that hot tub therapy helps lower blood pressure just like in cold water immersion. In addition, soaking in a hot tub also improves blood circulation, as well as ease muscle strains and tensions. 2. Are hot tubs and saunas safe for a pregnant woman and the baby? Hot baths or saunas are safe for pregnant women, given that there is a proper temperature management. Health professionals recommend having water that doesn’t exceed 32 degrees Celsius or 89.6 degrees Fahrenheit. The three main dangers when the water temperature exceeds the recommended level are overheating, dehydration, and fainting. To know more about hot tub pregnancy safety, read here. 3. How often should I change my hot tub water? Changing hot tub water often depends on the brand and model. The more you use it, the more often you need to change the water. Still, a little math can help, and it’s actually quite easy. Get the total number gallons your hot tub can hold. Take the answer you get (quotient), then divide it by the average number of bathers. The final number you’ll get will indicate how often you should change the water. So, if your hot tub can hold 300 gallons of water with 4 bathers in total, then you need to change the water every 25 days. 4. At what age can a baby go in the hot tub? Generally, babies and hot tubs are not a good mix. The Association of Pool and Spa Professionals stated that infants should not be permitted in a hot tub because their skin is too sensitive for the hot temperature. 5. Do you use a hot tub before or after the sauna? This is a bit unusual to go in a hot tub and a sauna right after the other. People usually choose just one and that should be enough. Saunas and hot tubs both use heat to make the body sweat and release toxins. Remember, it is not recommended to immerse your body to a hot temperature for too long, so going in a hot tub after a sauna or vice versa is not only bizarre but also harmful to one’s health. 6. Why does drinking in a hot tub increase the effects of alcohol? The main culprit here is dehydration. When you go in a hot tub, you will most likely sweat a lot. Now, sweating dehydrates the body. Once your body is dehydrated and you consume alcohol, it intensifies the effects. Why? Because consuming alcohol also expands your blood vessels, thus increases your body temperature. As a result, your chances of passing out, falling, and vomiting increase. Choosing the best hot tubs for your needs is a personal issue. As someone who does not like the idea of sharing with a few people, my personal favorite is the AquaRest Spas’ 2-Person 20-Jet Plug and Play Spa with Waterfall that is LED. I like the idea that it is relatively small and compact with all the features of a larger spa, while it will fit, neatly tucked away, into most homes. This makes summer and winter use a breeze. Additionally, because it is relatively small, the utility bill will not go up by very much, as water and electricity usage is much less as compared to other spas.